The biggest wind farm in England is officially opening after years of planning controversy. Residents objected to the 26 turbines standing more than 300ft (91m) high on Scout Moor, between Lancashire and Greater Manchester. 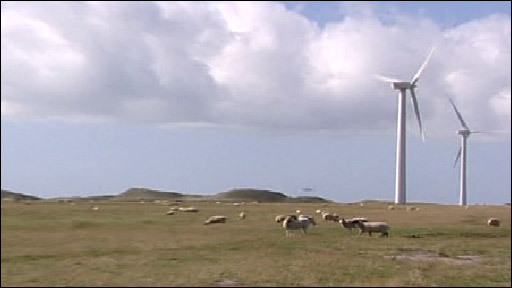 TV presenter and environmentalist David Bellamy said the giant turbines would be a "blot on the landscape". Local councils also objected but after a public inquiry the government decided the £50m project should go ahead. It was put into production last week and has already produced more than 4,000 MWh of electricity to be exported to the National Grid. It will produce enough electricity to power 40,000 homes. The wind farm, operated by the Peel Group, is on moorland near Heywood, between Rossendale and Rochdale. Richard Dibley, Peel Energy's development manager, said: "It has been quite a journey from the day the site was first identified and we'd like to thank everyone who has supported us along the way. "I am delighted this scheme is now complete. Schemes such as Scout Moor Wind Farm demonstrate the effectiveness of wind farms." Special guests at the launch ceremony included members of the building team and local councillors plus representatives of Peel Energy. The company says the project will help the government to meet its targets for reducing carbon emissions. Objections by the Friends of Scout and Knowl Moor included problems with increased traffic, damage to an untouched landscape and the noise of the turbines as their blades turned in the wind. Rossendale, Rochdale and Lancashire County Councils also opposed the scheme which was given the green light in May 2005 after a public inquiry. An open day is being held on 27 September to allow the public to go on tours of the facility.